Rembrandt’s art, like his life, traced the contours of sin and grace. 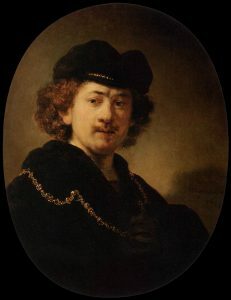 Perhaps no other artist captures the imagination and the heart of a worldwide audience more than Rembrandt van Rijn (July 15, 1606-October 4, 1669). Despite his continuing popularity as the greatest painter of biblical themes and an impressive body of scholarship about his work, Rembrandt’s faith has not been recognized and articulated as much as it should be. Here was a person whose phenomenal optic nerve was connected to the highest intelligence, tenderness of feeling, and complexity of character, yet many key details of his life and beliefs still remain uncertain. A vastly productive artist for over four decades, he left no personal diary. But he lurks in his paintings—not just in his famous self-portraits, but also in some subtle and not-so-subtle self-portraits embedded in other paintings and engraved works. One suspects that Rembrandt’s self-portraits were not only a reflection of his identity, but also an attempt to forge his identity.